YWCA Canberra is hosting a prom for young people across Canberra aged 12-25 who identify as LGBTQIA+ and their allies. 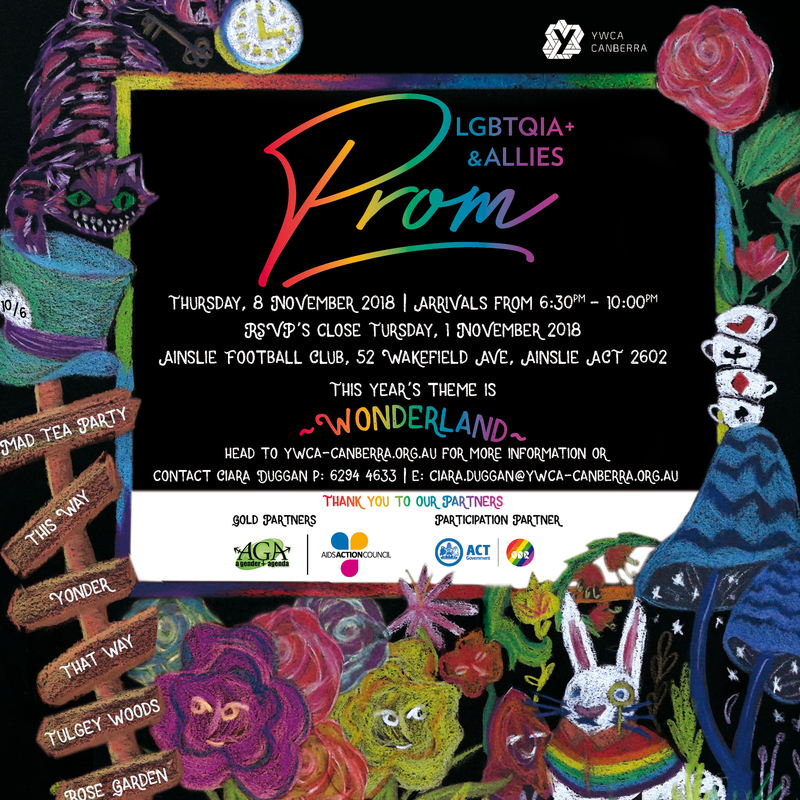 Now in its third year, the LGBTQIA+ & Allies Prom is an opportunity for young people to experience a formal style event and express their identity in a safe, supportive, and non-judgmental environment. This free event will be held at the Ainslie Football Club on Thursday 8 November and is strictly drug and alcohol free. To ensure this event is completely free and accessible for all young people aged 12-25 years to attend, we are calling on the community to help us by sponsoring a ticket for a young person to attend. Last year, through the incredible generosity of our community we were able to ensure that all Young People were able to attend the prom free of charge. We want to do this again! If you want to sponsor a ticket, or you’re a young person aged 12-25 years wanting to attend you can use the links below. recognition they deserve. These awards will be presented at our third Annual LGBTQIA+ & Allies Prom. Young LGBTQIA+ mentor for a young person who is taking on a mentoring role in the community. To nominate a young person, tell us in 250 words or less why you think this young person should be nominated for this category. nominators name and contact details. **young people will be notified of their nomination prior to the event. Nominations can be sent to ciára.duggan@ywca-canberra.org.au. Nominations will be assessed by panel of LGBTQIA+ & Allies Prom partners and awards will be presented at the 2018 YWCA Canberra LGBTQIA+ & Allies Prom on Thursday 8 November.